EssentOne Scheduler is a graphical job planning system based on the Essent Production Scheduling Engine that allows orders to be queued, scheduled, and monitored through one consolidated view. Submitted sales orders that are not scheduled or processed are queued for scheduling. Complete orders, individual line items, or even a part of a line item can be scheduled to a crew, individual, and/or work center. Orders that are not completely scheduled remain in the queue, displaying complete order and item status information, until work tickets are scheduled for every item or the order or item is canceled. When an order or item is added to the schedule, a work ticket is created that defines the work to be performed, the resources to be utilized, and the required labor. Items can have predefined setup and breakdown time that is taken into consideration by the production scheduling engine. When a work ticket is scheduled a duration is calculated. Setup and breakdown times are automatically included in the calculation; If a job must be paused for any reason, these times are automatically factored into the new production duration. Work tickets are graphically displayed in a Gantt chart, resource by time. Planners can scroll and zoom through resources and the timescale for both a macroscopic and microscopic view of production. Observers have the ability to see both the big picture and details for the organization, branch, department, resource, and job. Color-coding of jobs by status or type enhances the view and provides an at-a-glance view of orders processing within the system and throughout the organization. Scheduled work outages and blackout dates can be defined in advance that frame out a production window that are observed by the production scheduling engine. Jobs can be scheduled to any applicable and available resource. Scheduled work outages like scheduled maintenance and blackout dates like weekends are taken into account. Work tickets that require more time than allowed by the production window automatically span the outage. The production scheduling engine recalculates and extends the required production time to take into the account delays caused by the work stoppage. If a work ticket is inserted before an existing work ticket, the production scheduling engine will automatically reevaluate future jobs and make adjustments if necessary. Adjacent work tickets assigned to the resource are automatically rescheduled and bumped until the resource has been leveled. The status of all work tickets will be reevaluated and any adversely impacted by the change will be duly noted and color-coded in red, allowing for immediate identification and the opportunity to make a corrective action. EssentOne Scheduler includes all of the tools necessary to efficiently and accurately plan product and service production. 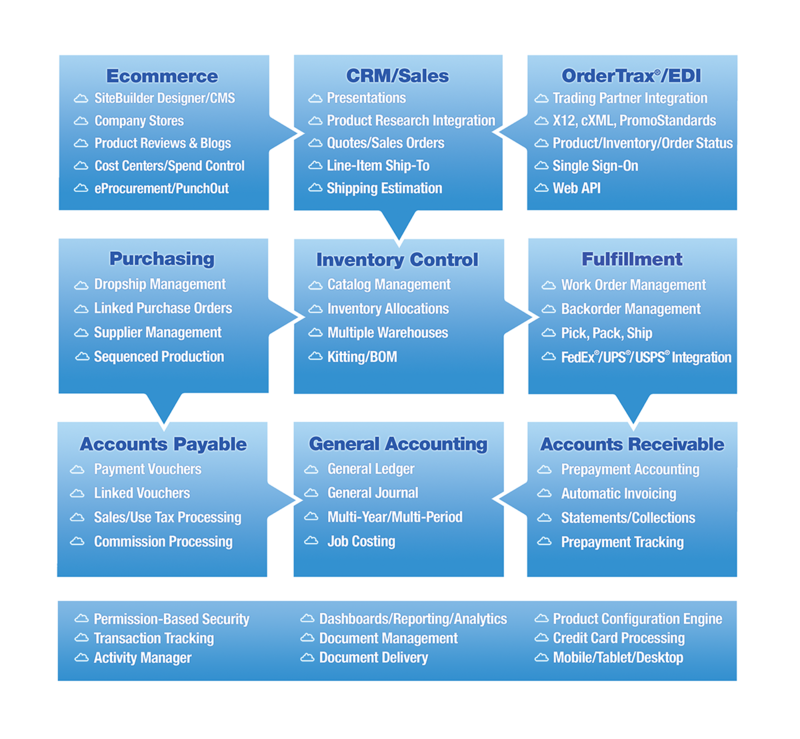 As a fully-integrated component of the EssentOne Business Management System, orders, products, services, employees, resources, inventory, and fulfillment information is automatically shared between EssentOne Scheduler and the rest of the system.